Find out which drain cleaner to use as your plumber-in-a-pinch—depending on your specific type of pipes and clogs. Nothing slows you down like a clogged, slow-draining sink, shower, tub, or toilet. Your first step should always be plunging the drain or snaking it with a drain auger if you have one, to clear drain dreck without damaging pipes. But if manual methods fail, a commercial liquid drain cleaner can save you a plumber’s fee. While not for use in completely clogged drains through which no water flows (the longer dwell time needed to clear such blockages could damage pipes), chemical- or enzyme-based solutions are effective in de-gunking partially clogged drains. Different drain cleaners, however, have distinct formulations and uses—and some have risks, so keep reading. We’ve identified the best drain cleaner for every slow drain you might encounter, as well as tips on how to use them correctly. There are three types of liquid drain cleaners, each suited for different drain locations and different types of pipes and clogs. The type and age of your pipes should be listed in your home inspection report. To determine the clog type, remove the drain cover (if present) and inspect the drain opening with a flashlight; clogs located near the opening can easily be ID’ed as hair, paper, etc. Tip: If the clog is deeper, make an educated guess based on the clog’s location (kitchen sinks are magnets for food and grease, bathroom sinks and tubs often collect hair and soap scum, and toilets attract paper products). You can also run a drain camera (rent from Home Depot for $137 for four hours) through the pipe and inspect the resulting images to determine clog type. Enzymatic drain cleaners ($0.25 to $0.40 per ounce) contain enzyme-producing bacteria like bacillus that feed on clogs. They’re designed for monthly use to prevent clogs and can also clear clogs comprised of soft material like hair or paper, but not tougher gunk like grease or soap scum; even on soft clogs they can take as long as 24 hours to clear. Their generally gentle formulations are non-corrosive to newer and older plastic and metal drain pipes in sinks, showers, tubs, and toilets. They’re also typically free of harmful toxins and skin/eye irritants, so protective gear is usually not required. Caustic drain cleaners ($0.15 to $0.55 per ounce) made with alkaline chemicals like sodium hydroxide convert the clogged material in a drain into a soap-like substance that dissolves under plain water. They’re best at removing food, grease, and soap scum from sink, shower, or tub drains—usually within 30 minutes, though most aren’t designed for use in toilets as they don’t handle paper products as well. They’re considered safe for use in newer (less than 20 years old) plastic or metal pipes made of stainless steel or copper. Avoid using them in plastic more than 20 years old (which they can soften), in older metal pipes or pipes of any age made of brass, aluminum chrome, or galvanized steel, which they can tarnish or corrode. While they’re less toxic than acidic cleaners (and usually odorless), they can burn the skin or irritate the eyes or nose with contact or inhalation, so wear a respirator, safety glasses, skin-covering clothing, and gloves made of a chemical resistant material like butyl when handling. 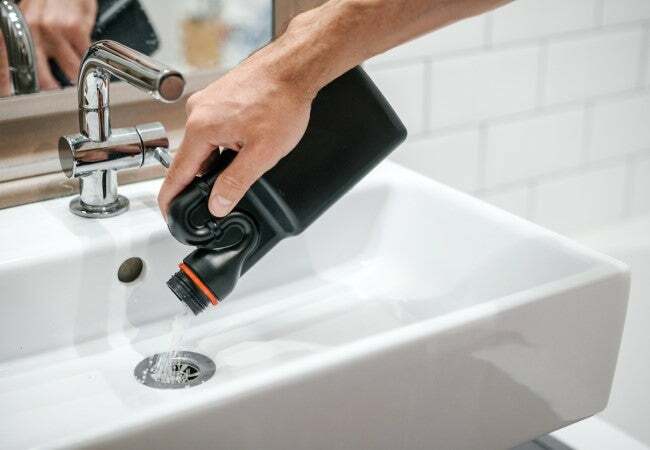 Acidic drain cleaners ($0.35 to $0.60 per ounce) made of sulfuric or hydrochloric acid are powerful enough to clear heavy-duty hair, food, grease, soap scum, or paper-based clogs in 15 minutes or less. 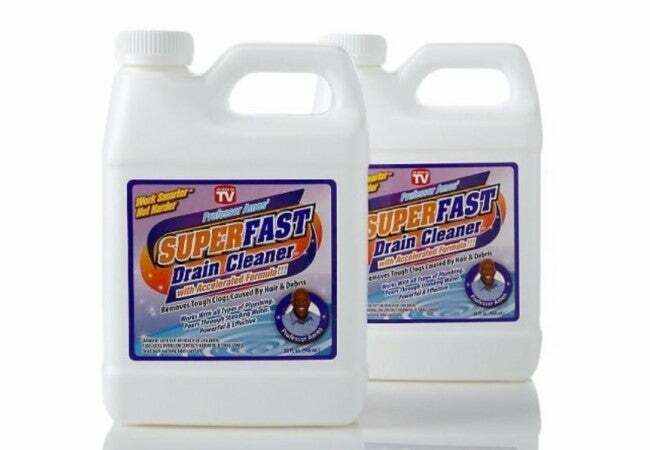 Due to their highly corrosive and toxic nature, they are seldom sold in home centers with other drain cleaners but can be purchased online. Acidic drain cleaners are generally safe for newer plastic or metal pipes (e.g., copper) in sink, tub, shower, and toilet drains. Don’t use them on older plastic or metal pipes or pipes of any age made of aluminum chrome, stainless steel, or galvanized steel. They’re capable of burning skin and irritating eyes and lungs if inhaled so safety gear—respirator, safety glasses, skin-covering clothing, and chemical-resistant—is a must when handling. Enlist these guidelines for safe and effective use of drain cleaner. Always read and follow package directions, adhering to specific amounts and dwell times. 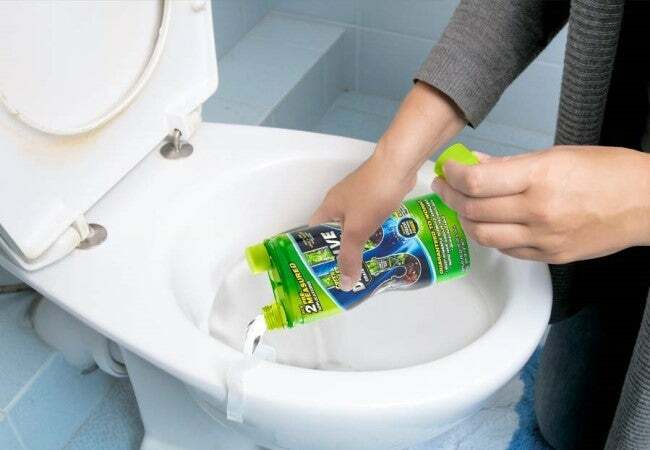 Never leave any type of drain cleaner inside drains for longer than the maximum dwell time; chemical cleaners, in particular, can produce enough heat to melt pipes or crack porcelain toilet bowls if left too long. Only use caustic or acidic cleaners in well-ventilated rooms. Turn on exhaust fans and/or open windows to increase air circulation. Always stand outside of tubs or showers when pouring drain cleaner. 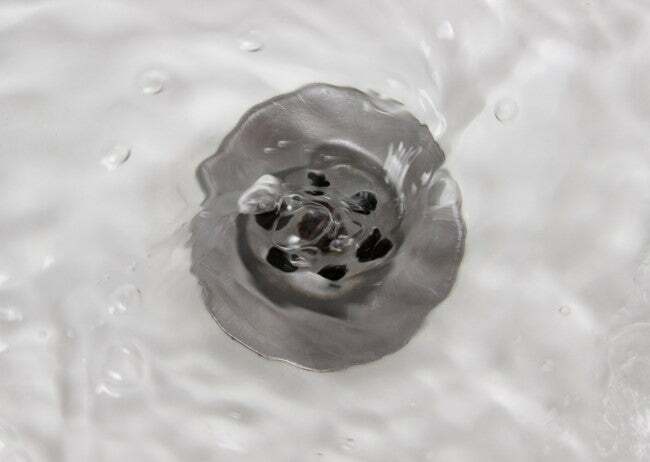 With the drain stopper removed, pour the drain cleaner as slowly and steadily as possible into the clogged drain. If using a caustic cleaner, avoid exposing it to natural stone surfaces surrounding a drain (e.g., a granite sink), to avoid etching it. For the same reason, don’t let acidic cleaners contact non-acid-resistant surfaces (e.g., a marble shower floor or stainless steel sink). Some chemical cleaners recommend applying a thin layer of petroleum jelly to the area of metal surfaces around the drain to stave off discoloration or damage. Never mix drain cleaners with other homemade or commercial cleaners; the chemical reaction that ensues could produce toxic gas or an explosion. Flush out any remaining cleaner with water at the temperature recommended in the manufacturer’s instructions. Trust these choices for the best drain cleaner in each category. This enzymatic cleaner with a proprietary blend of eco-friendly ingredients gobbles up toilet paper wads, cotton swabs, hair, lint, grease, and soap scum clogs. Use it in kitchen or bathroom sinks, tubs, showers, and even toilets—the non-corrosive, biodegradable formula is safe on all kinds of pipes, from plastic to copper. The dual-chambered container means no measuring required—simply pour one full chamber of the liquid into clogged sinks and tubs or two chambers into toilets. Give the product (which earned four out of five stars from satisfied Amazon customers) two hours to a full night of dwell time and then flush the drain with water to restore pristine pipes. Available on Amazon. Scour sink, tub, and shower drain pipes spotless—whether they be clogged by hair, food, grease, or soap scum—with this caustic cleaner, rated 4.3 out of five stars by Amazon reviewers. While the lye-based formula is tough on gunk, it’s gentle enough for pipes made of plastic and copper. The 32-ounce twin-pack comes with a convenient pour spout for effortless application. Pour a few ounces of cleaner into the drain, wait 15 minutes, then flush with hot water. Available on Amazon. 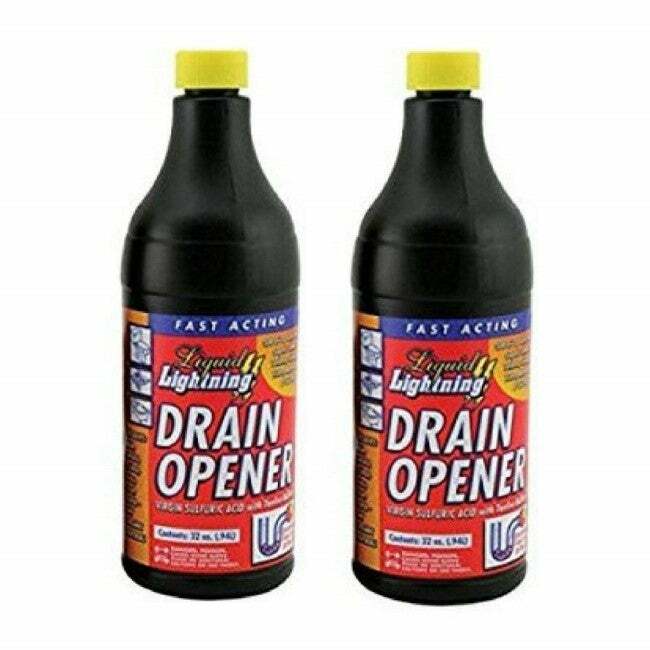 Sulfuric acid is the key ingredient of this ultra-strength acidic drain cleaner that scored five stars from Amazon shoppers. It’s potent enough to clear sink and toilet clogs that other cleaners leave behind—be they be made of hair, grease, soap scum, paper, rags, or coffee grounds. Use by pouring one-and-a-half to two cups of cleaner into a drain, waiting for 15 minutes, then flushing for five minutes with cold water. The cleaner will not damage plastic and acid-resistant metal pipes (e.g., copper) but isn’t for use in tubs or showers and it shouldn’t be used in pipes made of corrosion-prone metals like aluminum or galvanized steel. Available on Amazon.